These big cups have been a "bread and butter" form for many years. By that I mean these pots more than pay for themselves and allows me to speculate or experiment on other forms. Mark Shapiro describes these speculative pots as made on 'scholarship'. It's great to have a variety of forms and a diversity of interests to keep the creative fires burning. 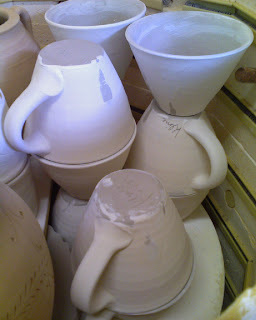 Like these cups fitting together in the kiln, it's great when all of one's ideas have room to 'fit' together.